At 2014 SIHH Omega announced a new 43.5mm Seamaster Planet Ocean Platinum watch (950-grade platinum engraved with diamonds) that is driven by the Omega Co-Axial calibre 8615 movement. As a part of the Seamaster line, the new timepiece is water resistant up to 60 bar (600 meters / 2000 feet) and it includes also black rubber strap. OMEGA’s long list of innovations and world premieres continues to grow with the launch of its exceptional Seamaster Planet Ocean Platinum with diamond-set ceramic and sapphire. It celebrates the debut of a complex and delicate world premier technology that allows for the setting of diamonds on hard bodies such as ceramic and sapphire. The stunning wristwatch has been produced in an initial edition limited to only eight pieces. The process begins with the engraving on a hard body using a special 5-axis laser that ensures the precision and the shape of the cavities. An exclusive 850-platinum Liquidmetal® alloy is used to fill the openings and the excess is removed before polishing the piece. Diamonds are then set into the Pt850 Liquidmetal® alloy using the traditional diamond-setting technique. The result is an unlikely pairing of a hard body and diamonds. The breathtaking innovation is introduced in a Seamaster Planet Ocean in 43.50 mm. Its brushed and polished case is crafted from 950-grade platinum with a bi-directional 24-hour GMT rotating bezel. The slant edges of the case are fully paved with 69 trapezoidal baguette-cut diamonds; the polished black ceramic bezel is accentuated by twelve trapezoidal baguettes in the GMT scale and a full-cut diamond in the triangle at 24 o'clock. Together with the 31-full-cut-diamond-set Omega logo on the sapphire caseback, this Seamaster Planet Ocean Platinum has 113 diamonds with a combined weight 2.69 carats. Beneath the anti-reflective domed scratch-resistant sapphire crystal is the polished black ceramic dial with 18K white gold indexes, numerals and hands. The OMEGA Co-Axial calibre 8615, fitted with a Si14 silicon balance spring, powers the watch and offers the useful GMT complication that allows the wearer to keep track of the time in another time zone. 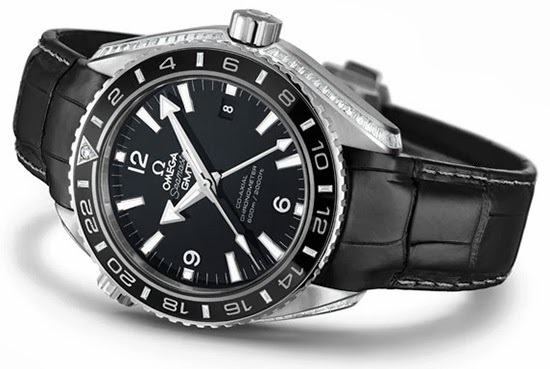 The OMEGA Seamaster Planet Ocean Platinum is water resistant to 60 bar (600 meters / 2000 feet) and is presented on an integrated black leather strap with platinum stitching and a 950-grade platinum foldover clasp. A black rubber strap is also delivered with the watch along with a special tool to change straps. This exceptional timepiece is delivered in a special wooden presentation box, with a full four-year warranty.